As Michigan voters head to the polls on Tuesday, they should ask candidates whether they will leave in place costly regulations that have added thousands to the price of new cars and depressed sales for the state’s iconic industry. Federal regulations that force ever-increasing automobile fuel economy standards cost consumers thousands of dollars more than what they save on using less gas. These burdensome regulations also reduce new-car purchases and, therefore, autoworker employment. How much more expensive are the gas mileage gains? Scholars estimated that the new standards would add at least $3,800 to the cost of a car in 2016 and at least $7,200 in 2025. This cost includes the gasoline savings. Empirical Heritage Foundation research supports those estimates. You only get what you pay for and you have to pay for what you get. Getting cars to meet the tighter efficiency standards means deploying expensive technology instead of using cost-effective engineering. High prices are bad for consumers and bad for autoworkers. 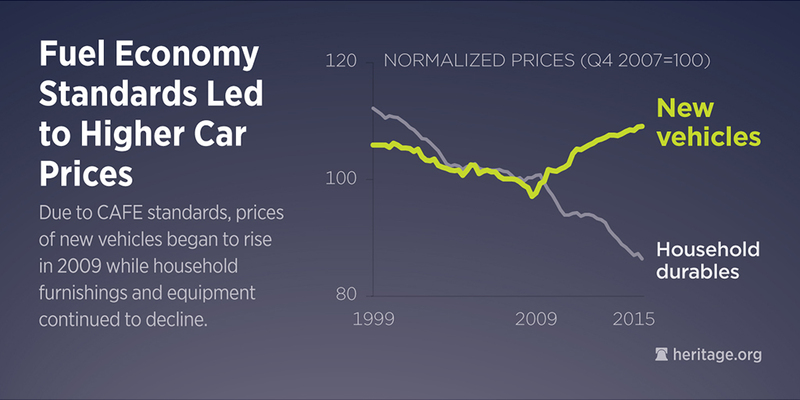 At higher prices, consumers demand fewer vehicles and automakers hire fewer workers. Thus, fewer U.S. autoworkers are employed now than in 2007 despite a drop in wages. Although the regulations may not hurt many corporations as much (because they can lay off workers and pass higher costs on to consumers), consumers and autoworkers have been the lab rats of this failed environmentalist experiment. David Kreutzer is the senior research fellow in energy economics and climate change at The Heritage Foundation's Center for Data Analysis. In this position, Kreutzer researches how energy and climate change legislation will affect economic activity at the national, local, and industry levels. Salim Furth, Ph.D., researches and explains how public policy affects economic growth as a research fellow in macroeconomics at The Heritage Foundation’s Center for Data Analysis.